Several new mobile and smart home devices have been detailed. Google has revealed its latest smartphone lineup. The new Pixel 3 and Pixel 3XL offer several advanced display, camera, and AI features. In addition, the company has also announced the new Google Home Hub smart screen and the Pixel Slate tablet. The Pixel 3 features a 5.5" FHD+ OLED display with 443ppi, an 18:9 aspect ratio, Corning Gorilla Glass 5, and UHDA Certified HDR support. Meanwhile, the Pixel 3XL steps things up with a larger 6.3" QHD+ OLED display with 523ppi, and an 18.5:9 aspect ratio. Under the hood, both models are powered by a Qualcomm Snapdragon 845 2.5GHz + 1.6GHz, 64Bit Octa-Core processor and 4GB of LPDDR4x RAM running Android 9 with Google Assistant. A 12.2MP dual-pixel rear camera and dual 8MP wide-angle and normal FoV cameras are integrated as well. In addition, the smartphones use AI and other advanced technologies to offer enhanced camera features, including a Top Shot option to take alternate shots and recommend the best one; a Super Res Zoom mode to maintain sharp detail when zooming in on images; Night Sight for high quality low light photography without a flash; Motion Auto Focus for video recordings; and more. Likewise, new Google Assistant features are being implemented as well, including a Screen Call feature to weed out spam and telemarketers. 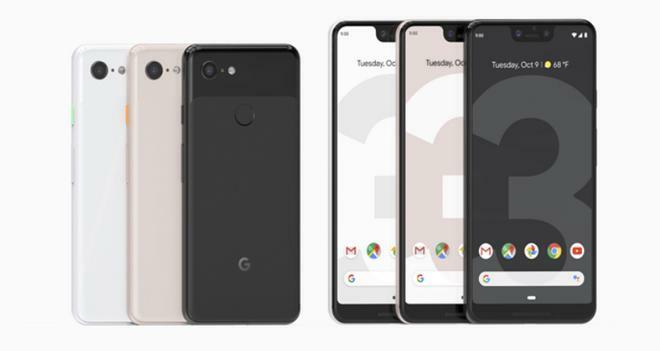 The Pixel 3 and Pixel 3XL are now available for pre-order from Best Buy with Verizon coverage. Pixel 3 models start at $799 while Pixel 3XL models start at $899. Meanwhile, outside of smartphones, Google has also revealed its new Home Hub. The smart screen device features a 7-inch LCD touch display with rounded corners and a fabric textured stand available in four colors. Google Assistant functionality is integrated as well along with far-field microphones, offering hands-free voice control for a variety of functions and tasks, including searches, YouTube, Google Photos, calendar, music, recipes, maps, and more. Likewise, the unit includes an Ambient EQ light sensor to automatically adjust screen brightness to match the lighting in a user's room. The Google Home Hub is now available for pre-order from the Google Store for $149. The device will launch in retailers like Best Buy on October 22. Finally, Google has detailed its new Pixel Slate as well. The tablet is powered by the Chrome OS and offers mobile functionality and desktop-style features. The device features a 12.3” LCD Molecular Touchscreen Display with a resolution of 3000x2000, 293 ppi, and 400 nits of brightness. Likewise, the panel includes support for the Google Pixelbook Pen. Under the hood, models will be available with 8th Gen Intel Core m3, i5 or i7 processor, or Intel Celeron processors, along with 4GB, 8GB, and 16GB RAM options. 8MP rear and front cameras are integrated as well, and the unit includes dual front-firing speakers. Google Assistant functionality is also supported, and battery life is rated for up to 12 hours of use. The Pixel Slate is set to launch later this year with configurations starting at $599. Meanwhile, an optional Pixel Slate Keyboard will also be available for an MSRP of $199.